*Note: Movements III and IV have not been recorded. ​The Quartet for Piano and Strings, Op. 82 is a large-scale work written for professional performers, though is it certainly accessible to outstanding university musicians. 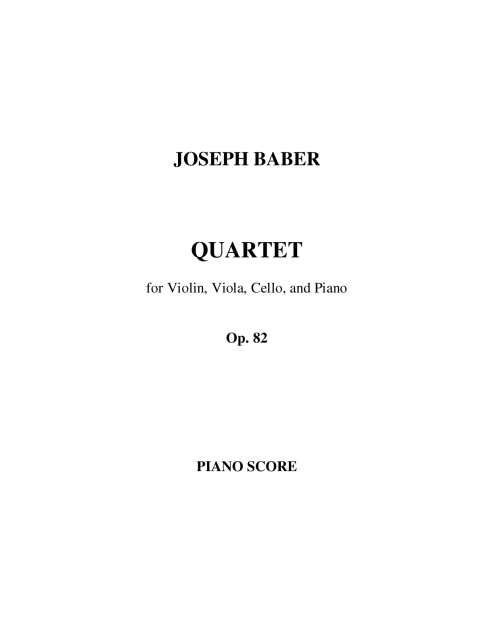 In four movements and nearly 30 minutes in length, the Quartet is, along with the Sonata for Three Cellos and Piano, an example of Baber's muscular, lyrical, neo-classicism at its most mature. The work was commissioned by the philanthropist Lucille Little to be performed at the Dedication Ceremony of the new Fine Arts Library that bears her name, on the campus of the University of Kentucky, in Lexington, February 16, 2001.